14k gold custom made right hand ring consisting of european cut shape, natural diamond, weighing 2.11 carats, having a M color and VS1 clarity, according to GIA grading scale. The center stone measuring 8.15mm x 8.27mm x 5.15mm. All surrounding peridots are genuine with a total carat weight (cttw) of 0.34 carats. Chip Description: There are several very small chips along the girdle as well as a small one. These all are sliver like extending into the crown. Inclusion Description: The grade making inclusions are: a small feather located in the girdle, and a small feather located in the pavilion near the girdle that is not visible from the top. There are also additional tiny abrasions/bruising along pavilion facet junctions. Blemishes Description: There are some shallow scratches located on the pavilion facets. Diamond is an Old European cut circa 1920. The mounting is modern. 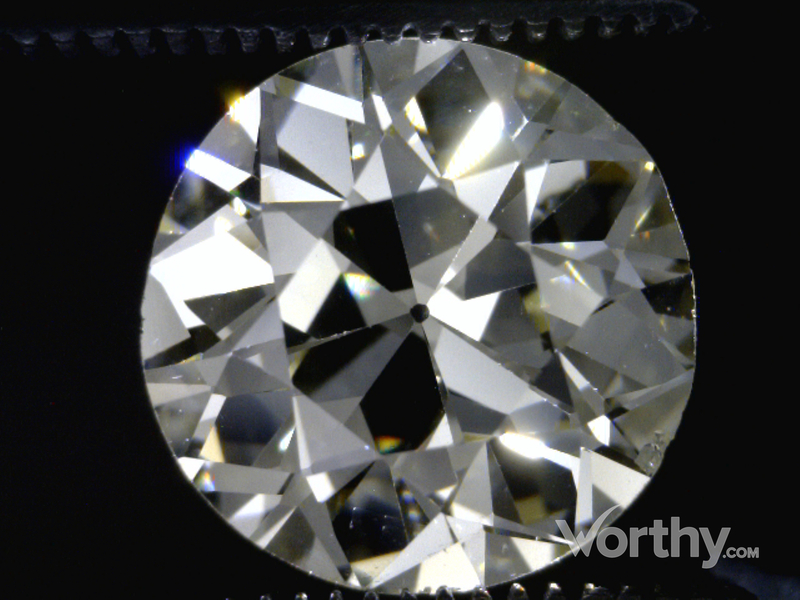 This diamond was removed for examination. Ring is a European shank.